Spacious open decks with swimming pools create a superb environment to watch the seascape or the sailors positioning the sails. Gleaming mahogany rails with brass fittings reflect the grand old age of sail, while state-of-the-art equipment matches 21st century cruising. 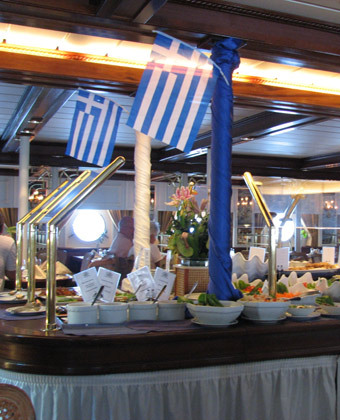 Dining aboard is a culinary adventure with an international menu of food. Elegant dining rooms with open-seating and a casual elegance feature on all ships. On Royal Clipper the dining room is lit by sunlight from the 3-deck atrium. Help yourself to an attractive continental or full breakfast. At lunch, a superb buffet of seafood, salads and grilled favourites awaits. When evening comes, enjoy the chef’s finest culinary presentations, designed to please the eye and the palate, with the service of a sophisticated restaurant. All passengers have access to complimentary water sports including banana boating, sunfish sailing, water skiing and windsurfing, supported by friendly, professional Water Sports staff. A marina platform conveniently lowers from under the Royal Clipper’s stern for diving and water sports and Star Clipper and Star Flyer offer similar activities from the tender service or on-shore facilities. Varied daily activities are included in the cruise schedule, and exciting shore excursions are always an option. Enjoy the convivial indoor-outdoor Tropical Bar, the Piano Bar, or library, and the spa and health club on Royal Clipper. A cruise highlight for many is the climb, with safety harness attached, to the lookout stations on the first yardarm high above the deck!